Would be interesting analyze the Thomas Mahon work. For exemple,what about these DB coats? Never read the old tailor and cutter journals, but I never heard they were criticize of tailors. They might have said things without naming names. Out of the public eye they may have said things as lessons. This is certainly not new and has been done by tailors around the world. By drawing attention to it draws customers in. Otherwise customers can stay dumb. Is this an old coat and he has gained around the waist? If you put a hand in a pocket that usually pushes the shoulder above up. The white stripe here on the left coat is a unique style or fashion. It looks like it comes to the edge at the bottom of the roll. These two coats certainly don't have the "British" flare from the waist down. The shoulder line in particular is poor. A sad irregular droopy thing. You can see the wadding like a little hump. Such a shoulder construction is OK if the customer has athletic shoulders but in Will's case they should be treated differently. But his jackets do have a distinctive non-generic look and (as I heard) feel, and those are important to set oneself off in a competitive market. armhole line contour is a bit strange at the armpit on all jacket. The shoulder line in particular is poor. A sad irregular droopy thing. You can see the wadding like a little hump. Here's a question, I know Mahon is former A&S and that A&S cuts a rather throw-back bias cut shoulder. Is Mahon cutting these coats as they would have been cut at A&S? I can't help but seeing a similarity in the shoulder shape you've described here and photos from 100 years ago. Is the bias cut shoulder at the root of this? Edited by I.Brackley, 18 January 2011 - 07:36 AM. It sometimes makes for interesting reading. I believe that the above photos of Will were quoted from his blog. Secondly, I almost hesitate to criticise A&S alumni because there is a group of devotees who feel that critical appraisal of their work is little more that the blasphemy of infidels, and that only devout worship is permissible. All else is the work of the devil, which makes me the devil incarnate. What I believe is in critical study and learning the honest and unbiased truth. If something works on objective grounds, it is one's duty to say so. If something doesn't work, likewise. In this case, one feels duty bound to point out some basic problems. It is not that one wants to do such a thing or be nasty, but in this case there are objective problems that go beyond matters of taste. It is all about honesty. 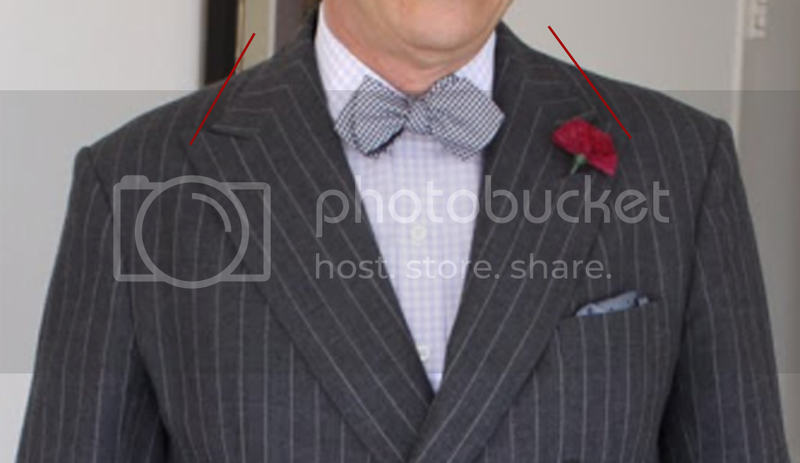 Notice the way the stripes run off on an angle below the buttoning point? The fronts are trying to swing open. These are symptoms of a long front balance. Mr Mahon has previously stated on his blog that he prefers to have the front balance too long to start with and then correct this at fittings ( ). This tends to make the front balance long, but it can be compensated for during fittings and in the making up process using old fashioned manipulation techniques that were popular amongst pre-Scholte era Victorian tailors. Scholte is widely accredited in the English literature with rendering these manipulations redundant. Ian mentions the bias cut shoulder but this in itself isn't that important as is the short back neck (3"). This tends to exaggerate the sharp angle of the stripes at the shoulder and makes the front balance even longer. Dellafera says that this is often due to an excessively long front balance on figures that tend to be somewhat corpulent. This perfectly sums up what is going on here. The whole art of the tailor is about using structure in the form of canvas and various types of padding to conceal these sorts of problems. It is unfortunate that the cult of the unstructured shoulder amongst clientèle is undermining the art. It seems to have spawned a whole lot of coats with protruding bony shoulders and uncorrected shoulder slope because of some misguided belief that undermining shoulder structure is a good thing. A "crooked coat" is synonymous of coat with natural shoulder? Is the classic Ivy league coat "crooked? The Mahon "back to victorians" is intentional or involuntary? And more in general,if these features on Mahon's coats are defects.. If a expensive tailor commits these...well..naivety..
the blame is on him or on misguided clients? by the reputation of Rubinacci school? 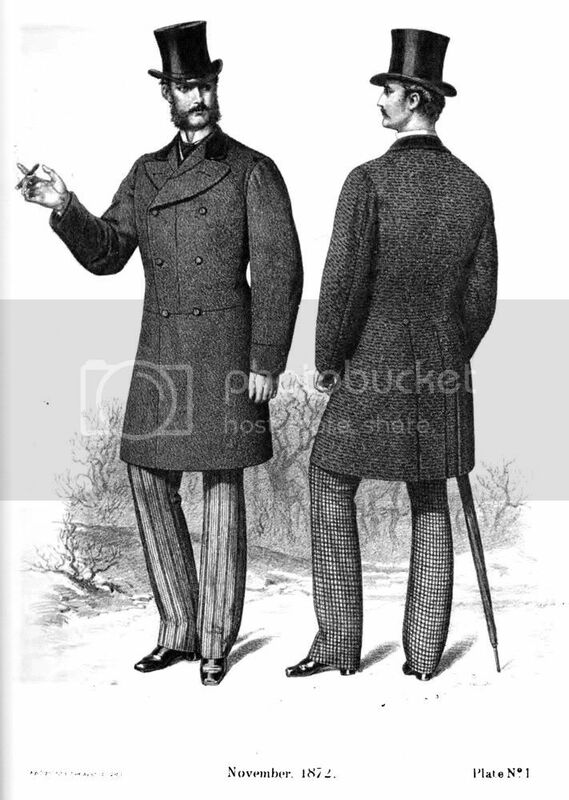 A probable Victorian crooked coat. A late 20s Scholte coat for the Prince of Wales. 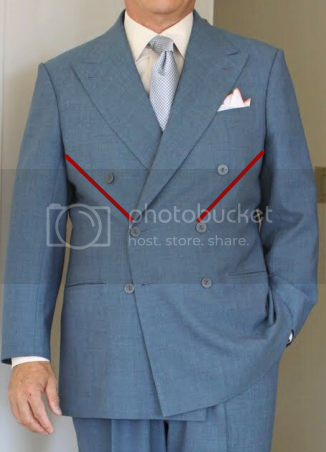 Anderson & Sheppard cutter in early 70s (whit a crooked coat or a natural shoulder coat)? And the Napolitan but structured shoulder of Pirozzi. Edited by carpu65, 18 January 2011 - 02:03 PM. I don't know what that is. American texts follow European ones and become less and less crooked after the 1920s. If by "classic Ivy league" you mean a 1940s-50s American cut then it is not crooked at all. I cannot speak on his behalf. BTW Edwardian cuts were still quite crooked. 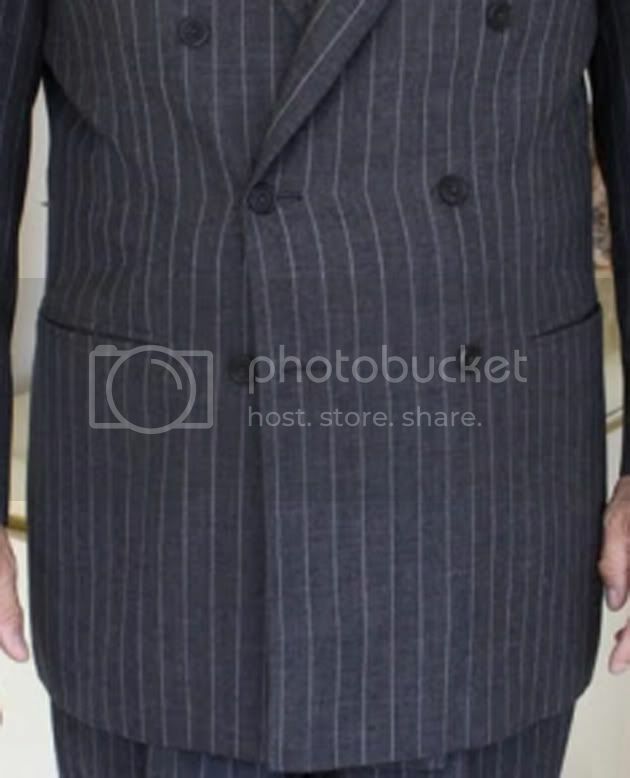 I should add that by the time the tailor had finished working on the coat, the shoulder was no longer crooked, although you will still be able to see any stripes going off an angle at the shoulder. I suspect with Mr Mahon's cuts, the shoulder is left in a fairly crooked position, so this is quite different to Victorian-Edwardian tailoring. I think there is a misunderstanding that Neapolitan tailors always omit all shoulder padding on all clients. I don't believe this is true, even of Rubinacci. Pirozzi is Neapolitan yet his shoulders are impressively shapely. People then try to force this on other tailors. Also up till around the Edwardian era I believe that the fashion was to make most coats with unpadded shoulders. Padded shoulders were called "American shoulders". Where did this come from? I don't know. Remember that A&S started in 1906. If they have preserved the cutting methods of this time, the cut would be crooked. It would not surprise me if Scholte himself followed the general trend internationally towards a more modern, straighter cut after 1906. Cutting systems of this period don't leave you any room for shoulder pads, and the draught has to be modified to accommodate them. How many coats that Will is wearing in this thread is made by Thomas? I looked on his site and I didn't see anywhere that Will wrote that Thomas made that light blue one. It is very clear that Will gets clothes made by a number of tailors and some are store bought and some he is probably modeling. Here are some pictures to think about. It looks like the fronts are to short and not crooked enough thus far. Here below is a coat made by another tailor from another country. Clearly the art of tailoring is more than just the stuffings. Nor the weak shoulders anti-tailoring. Another problem with all of these forums is personal preferences where people are saying others are wrong. If you were around the old tailors 50 years ago, when there were lots of them, you would hear many reasons why over shooting the shoulder or why short. You would hear why over padding and why none and many methods of them in between. Fashions come and go and come and go again and so on. It has always been the customers that drove the tailoring world to where it has been. Where will the customers drive it next? Today there is none of this talk. Just preferences and accusations. This continued drivel is not educational at all. Tailors are genies that come out of the bottle when the customer arrives, and says, "At your service master." A&S doesn't cut all back of neck 3" width. Some of their coats are that way, some are less. People accusing when they don't have half the facts gets tiresome. What worries me most is that a knowledgeable man like Will Thoelke shows himself in such ill-fitting garments. He needs a corpulent cut and I doubt that his coats are cut that way. The problem with Mahon's cut is the lack of possibilities of adapations for different figures, especially the tricky ones, and Mr. Thoelke definitely belongs into that group. AFAIK, Mahon cuts his coats without a side body, which limits the fit further. At least I cannot spot any wedge, just the underarm dart. The most famous in 40s-50s was Cesare Attolini,but in the last decades have changed many (in 90s: Manna and Panico). So a Rubinacci coat cut in 1993 is different from another cut today. However,the main characteristic has always been the less possible of padding. Others sartorial schools in Naples instead use padding (Today Pirozzi for exemple). 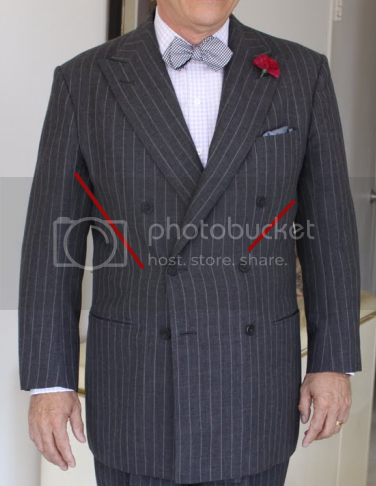 With internet i fear Napolitan tailor and Rubinacci are become synonymous,but is not so. Today Rubinacci have cutters in Naples,Rome,Milan and London,so the shape of the shoulders can be different. But is sure that a crooked coat is a wrong coat,that the stripes going off an angle at the shoulder are a fault? Could not be a characteristic,a conscious taste choice? Ugh, that shoulder seam is terrible and it really does come from one of his cutters. That is like having a ferrari with a big dent in it, not to mention the collar. The art of the tailor isn't always about fit. Fashions aren't always about fit. But, the composition should be good. Some people have a good eye and others don't. Mahon cuts his coats without a side body, which limits the fit further. Is this always true? He might like that cut most of the time and push it, but is it always true? I suspect he cuts many more methods than you imagine. As far as limits, some cloth, there is a tremendous amount of shaping that can be done with an iron and know how. If you have not seen great iron work, then you have no idea what can be done and why some old tailors disliked sidebodies. What worries me most is that a knowledgeable man like Will Thoelke shows himself in such ill-fitting garments. Most customers don't know what a good fit is nor much else about clothes, that is why they are customers. They don't have the training, and I would just as soon leave most of them in the dark. The fit on these coats have nothing to do with not having a side body and wedge, in fact you don't need a side body and wedge to get a good fit, why do the younger generation of tailors swear by a side body and Donlon Wedge, have they not learned how to make a coat without one, the results would be just as good if not better, if cut well and the iron is used correctly. Edited by jukes, 19 January 2011 - 07:11 AM. What throws the collar off are the extended shoulders and a false slope. The "weight" of the sleeve does the rest, pulling the shoulder down. There are quite a few things that make Rubinacci undesirable for me, most prominent subject is the ugly cut and set sleeve and, of course, the extended shoulder. I have seen very few coats from Rubinacci that are flawless in the fit department. I also think that the term "natural shoulder" is misleading, since today it has become a synonym for the unpadded, soft and extended shoulder. The pagoda/ saddle shoulder follows the "natural" curves of the body way better and, if well done, will be more comfortable even with more structure in it. Plus it looks better (that doesn't mean that the unpadded shoulder has to look bad. It's the "extreme" extension of the shoulders that makes it look "weird", at least for my taste)! 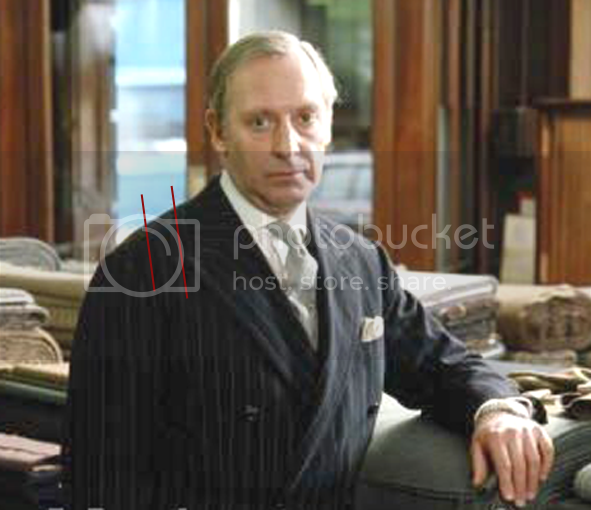 Mr Mahon was Will's exclusive tailor for several years, and it is only recently that he has branched out and tried various different tailors. I think this may have been forced by Mr Mahon reducing his travelling schedule to the US, but there might have been other factors too. If all canvas and padding is useless stuffing then all you will be left with is the shirt jacket (giacca camicia) - no canvas and no padding. As Carpu suggests, tailors who prefer to always make as light and softly as possible still aim to create as shapely a garment as possible within their limitations. It is simply untrue that they dismiss all canvassing, domette/flannel, and padding as useless "stuffing". Neither canvas nor padding is merely "stuffed" into a coat. Both are carefully worked up with darts, the iron, and padstitching. No tailor merely stuffs canvas into a coat. Barbera is a fashion designer like Tom Ford. He is not a tailor. 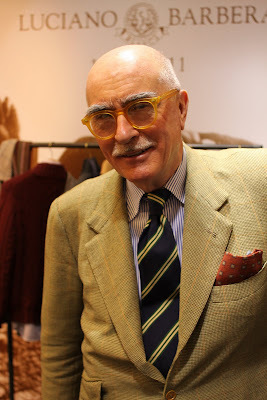 In that interview from which the picture is taken, Barbera talks about making more shirt jackets. A tailor who knew better would do a little to correct those bony shoulders. There has always been a problem with clients who are Mr Knobby Knowalls. Not all figures can wear all fashions. If Knobby with sloped and bony shoulders turns up to the shop demanding that the tailor lick his boots and obey his command to slavishly follow the fashion for unstructured and unpadded shoulders, a better tailor will insist on at least a bit of padding and combine it with an extra piece of soft canvas at the shoulder to conceal the bones. All this can be done within the limitations of unstructured tailoring. It has previously been reported that they fix the back neck at 3". This fact may have been reported incorrectly but it has been reported. B.W. Poole fixes the front neck point and keeps it the same distance on all chest measures. So it would not surprise me one bit if in another cutting system of this era, the back neck were similarly fixed on all figures irrespective of chest measure. Whatever the case, it is a moot point because whether fixed or proportionate, their back neck is still very short and this accentuates the crookedness. While I am flattered to see so many photos taken from ASW in this thread, it might have been more useful had someone simply asked me about my experience with Thomas. Mahon has been one of my tailors for about five years, however I have clothes underway from three to five tailors at any given time as it is my practice to never have more than one garment in the works from any single tailor. I am also using Poole, Davies, W. W. Chan and the trousermaker Salvatore Ambrosi currently. Of the coats pictured, several are from Anderson & Sheppard and not Mahon's work at all. At least three others were returned to Thomas earlier this year to fix a problem under the arms that crept into the pattern in 2009, causing the center button to pull. They are in transit as I write this so we do not yet know the result of that work. Edited by Will, 19 January 2011 - 07:34 AM.